The Traditional Mexican Yoga Blanket with tassels is more than just a yoga prop! 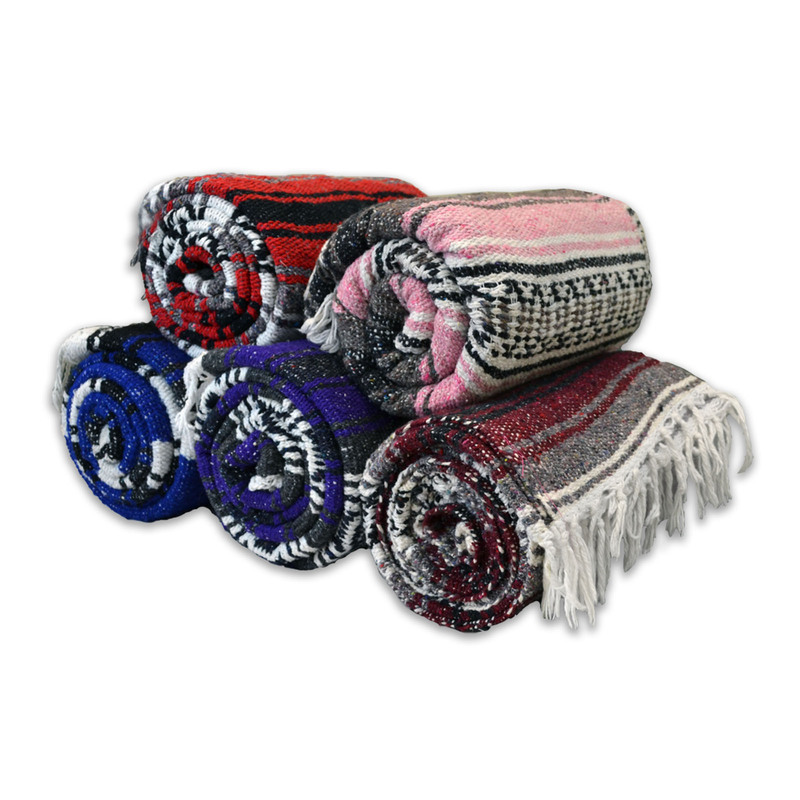 Great for restorative yoga, meditation, as a mat for outdoor practice, picnic blanket, beach blanket, and more! These patterned blankets, available in 13 color themes, are a necessity in any professional yoga space. Easily machine washable in super soft yet durable woven fabric. Hold fast color will not fade in the washing machine or in the sun. Place under buttocks in lotus pose if your hamstrings are tight. Or, cover yourself up in Shavasana to keep your body warm as it cools down -- it's large enough to cover your whole body! I'm a blanket junkie. I thought I would get one to see how it was. I LOVE it. I will be adding more to my collection. Is it beautiful and I was very impressed. Plus my order shipped super fast. Awesome blankets: no hanging pieces of yarn when they arrived; ran them through the dryer with some Alpaca hair balls, and they were incredibly soft right away. One of the most commonly used props I have yet to add to my om gym! I love these blankets and haven't found them at a better price. This blanket is really pretty. The color is vibrant and the weave is close (no large spaces in the weave). I purchased the light blue and black to coordinate with my Light blue and my black mats and blocks. very soft. great color variety. You can’t beat the prices and quality. The blanket is so soft and cozy. It’s the perfect size for bringing anywhere as it’s less bulky than a full-sized blanket. I love these blankets. Very happy with my purchase. The blankets arrived packaged very well in nice sturdy box. The colors are just as pictured on website. I thought they would be thinner so was pleased that they are not. I purchased these blankets for my own practice and they are of a really good quality. Great size to cover the body and thick enough to be used as sitting support during practice. They wash well, however, as in all 100% cotton products, it is highly recommendable to use cold water and just air dry in order to prevent them to shrink.